The Illinois Senate is the upper chamber of the Illinois General Assembly, the legislative branch of the government of the State of Illinois in the United States. The body was created by the first state constitution adopted in 1818. The Illinois Senate is made up of 59 senators elected from individual legislative districts determined by population; redistricted every 10 years, based on the 2010 U.S. census each senator represents approximately 217,468 people. Under the Illinois Constitution of 1970, senators are divided into three groups, each group having a two-year term at a different part of the decade between censuses, with the rest of the decade being taken up by two four-year terms. This ensures that the Senate reflects changes made when the General Assembly redistricts itself after each census. Depending on the election year, roughly one-third, two-thirds, or all Senate seats may be contested. In contrast, the Illinois House of Representatives is made up of 118 members with its entire membership elected to two-year terms. House districts are formed by dividing each Senate district in half, with each senator having two "associated" representatives. The Illinois Senate convenes at the Illinois State Capitol in Springfield, Illinois. Its first official working day is the second Wednesday of January each year. Its primary duties are to pass bills into law, approve the state budget, confirm appointments to state departments and agencies, act on federal constitutional amendments and propose constitutional amendments for Illinois. It also has the power to override gubernatorial vetoes through a three-fifths majority vote. The Illinois Senate tries impeachments made by the House of Representatives, and can convict impeached officers by a two-thirds vote. Voting in the Illinois Senate is done by members pushing one of three buttons. Unlike most states, the Illinois Senate allows members to vote yes, no, or present. It takes 30 affirmative votes to pass legislation during final action. The number of negative votes does not matter. Therefore, voting present has the same effect on the tally as voting no. In 1924, Florence Fifer Bohrer became the body's first female member and Adelbert H. Roberts became its first African American member. In 1977, Earlean Collins became the first African American woman to serve in the Illinois Senate. Barack Obama, later the President of the United States, served in the Illinois Senate from 1997 to 2004. Ɨ Legislator was appointed to the Illinois Senate during session. 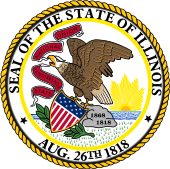 ƗƗ Legislator was appointed to the Illinois Senate after being elected, but prior to inauguration day of the General Assembly to which they were elected. ^ "Wayback Machine" (PDF). archive.org. October 7, 2012. ^ Gonzales, Nathan (13 February 2007). "The Ever-'Present' Obama". The Rothenberg Political Report. Retrieved 26 September 2014. ^ Burnett, Sara (14 February 2013). "Illinois Senate votes to legalize gay marriage". Associated Press. Retrieved 26 September 2014. ^ Sam McCann (District 50) switched parties from Republican to the Conservative Party, which McCann created for the purpose of running for governor. ^ "Illinois Democrats will have historic majorities". WQAD.com. 29 November 2018. Retrieved 21 January 2019. ^ Thomas, Whitney Freund (April 1998). "Florence Fifer Bohrer: A Woman Before Her Time". Illinois History: A Magazine for Young People. 51 (3): 59–60. ^ Gherardini, Caroline, ed. (February 1984). "Honors". Illinois Issues. Vol. 9 no. 2. Springfield, Illinois: Sangamon State University. p. 41. ISSN 0738-9663. Retrieved August 21, 2017. ^ Musser, Ashley; Dutton, Julie (February 11, 2016). "Illinois Women in Congress and General Assembly" (PDF). Springfield, Illinois: Illinois Legislative Research Unit. Retrieved August 21, 2017. ^ Miller, David R. (ed.). "A Former New Member: Barack Obama (D-13, Chicago) (From First Reading, December 1996)" (PDF). First Reading. Springfield, Illinois: Illinois Legislative Research Unit. p. 4. This page was last edited on 17 April 2019, at 15:17 (UTC).